The Tennessee River Valley is known for its recreational waterways where an abundance of lakes and rivers offer endless outdoor fun. History flows through theses waters and for a glimpse into the role the Tennessee River Valley played in the Civil War, visit one of many historical sights along the Tennessee and Cumberland rivers. - - - The Tennessee and Cumberland rivers snake their way through the state of Tennessee where they welcome millions of visitors each year who descend on the cool waters for outdoor recreation fun. While outdoor recreation may be the first thing that comes to mind when planning a trip to these rivers, travelers are learning about the Tennessee River Valley’s role in the Civil War. Dotted along the rivers in Tennessee are several battle sights that played a significant role in the War Between the States. Shiloh National Military Park, Shiloh, Tenn. The 4,200-acre Shiloh National Military Park preserves the battlefield of the Battle of Shiloh, where more than 24,000 soldiers were killed, wounded or captured during the Civil War in April 1862 as confederate forces took the Union Army by surprise, yet later withdrew after the battle. The two-day battle, which took place on April 6 and April 7, 1862, was one of the first major battles in the Western Theater of the American Civil War. The two days of fighting did not end in a victory for either side. The Union held the battlefield but failed to pursue the withdrawing Confederate forces. Strategically, however, it was a decisive defeat for the Confederate forces that had concentrated to oppose Ulysses S. Grant and Don Carlos Buell’s invasion through Tennessee. 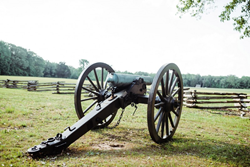 As one of America's best-preserved battlefields with 156 monuments, 217 cannons and more than 650 interpretive markers, the Park also offers a 10-mile self-guided driving tour. Visitors are encouraged to start at the visitors center with a short video, visit the gift shop and experience the park's beautiful views of the Tennessee River with an afternoon drive. Located within the boundaries of Shiloh Battlefield is also a United States National Cemetery, which contains around 4,000 soldiers and their family members. Nathan Bedford Forrest State Park, Eva, Tenn.
Nathan Bedford Forrest State Park is named for the Confederate cavalry commander in recognition of his November 4, 1864 surprise attack and destruction of the major Union supply depot at (Old) Johnsonville across the Tennessee River from this site. History lovers appreciate the park's interpretive, historic signage, as well its Tennessee River Folklife Interpretive Center and Nature Center inside of the Folklife Center. This 2,587-acre state park is also a popular hiking, fishing and camping spot, with three campgrounds, cabins, picnic areas, boat ramps, nature programs and over 30 miles of trails, from a .25-mile to a rugged 20-mile trek. Pilot Knob, the highest point in West Tennessee, is also located here. This is an official Dark Sky Park, so be prepared to be amazed by the stars as they make their way through the park's darkness. Johnsonville State Historic Park, New Johnsonville, Tenn.
Now a state park, the site of Johnsonville was named for President Andrew Johnson when he was Military Governor of Tennessee. Established along the railroad by the Union Army to provide supplies to Nashville during the Civil War, the town was later destroyed by Confederate General Forrest in the 1864 Battle of Johnsonville. Johnsonville State Historic Park commemorates the site of the Johnsonville Depot, the Battle of Johnsonville and the historic town site of Johnsonville that existed from 1864 to 1944 prior to the formation of Kentucky Lake. Today, visitors to this 1,075-acre park can see remnants of the supply base, original breastworks (rifle pits) and two large preserved redoubts. The park also has a visitor center, which features a museum, theater and gift shop that offers visitors an opportunity to learn more about the Johnsonville Depot and the 1864 Battle of Johnsonville. Approximately 10 miles of well-maintained trails wind through this historic area and are enjoyed by hikers and recreational walkers. In addition to hiking and walking, birding, geocaching, swimming, fishing from the bank and picnicking are all popular with visitors to the park. Fort Donelson National Battlefield, Dover, Tenn. In February 1862, this battlefield set the scene of the first major Union victory in the Civil War. Within days of the surrender, Clarksville and Nashville fell into Union hands. See the earthworks and remnants of the historic fort, cannons and the clear vistas of the Cumberland River. Additional amenities include a visitor center, a picnic area and approximately 6 miles of hiking trails. Established in 1867, Fort Donelson National Cemetery is the final resting place for soldiers originally buried in the Fort Donelson area. Although a majority of burials are from the Civil War, soldiers from a number of subsequent wars are also buried here. A cemetery shelter contains interpretive panels and a grave locator. Dover Hotel / Surrender House, Dover, Tenn. Here on February 16, 1862, Confederate General Simon Buckner accepted Union General Ulysses S. Grant's terms and agreed to an "unconditional and immediate surrender" of Fort Donelson and its garrison during the Civil War. The structure, originally built in 1851 as the Dover Hotel, was General Buckner's headquarters during the battle. The exterior has been restored to its original appearance by the National Park Service. The museum is only open from Memorial Day to Labor Day. Humphreys County Museum / Butterfield House, Waverly, Tenn. This 1922 Mansion with a Civil War Fort in the backyard is filled with historical county and military information. The museum includes a Civil War room, World War I room, World War II building, Jesse James exhibit, Captain Anderson exhibit and other interesting collections donated by Humphreys County residents. Along with these Civil War sights, the Tennessee River Valley offers a compelling story, captivating visitors with its little unknown facts, pristine, untouched areas and rich, authentic experiences. Save trip ideas and plan a trip easily with the Tennessee River Valley Geotourism MapGuide, an online guide of authentic places and adventures that have been recommended by locals.